By now most of our dear readers surely must realize we’re a few bucks shy of being certifiably eccentric. (Given our present financial state, please refer to us as simply daffy.) 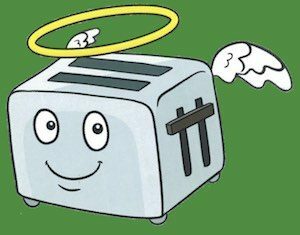 True, we give our kitchen appliances names, and then write about the adventures of these “angels.” We call them angels because, like God’s celestial messengers, these kitchen tools and appliances generally have a life-changing lesson to impart — if we look for it. I’m LUKE! He’s Nuke. Can’t you see the difference between us?! Luke and Nuke have their own little rooms, so to speak. They reside in two compartments located among the kitchen cabinets — well above the countertop — because one of us is a stickler for keeping the counters free of clutter! (Note: I’m pleased to say, “That would be me!” —Wilma) And it is from their “perches” that Luke and Nuke survey the scene below, quietly watching and awaiting our every quick-cooking need. I’m NUKE! I’m better-looking than Luke. Smarter, too. We recently called upon them to cook two frozen mini-pizzas. The instructions on the box stated: “place pizza on top of carton, then place carton into microwave.” We did this — twice — and 90 seconds later Luke and Nuke beeped us that it was snack time! Wilma thought she’d thoroughly cleaned out Luke and Nuke, but when she reached up and felt around on their glass trays (Note: On her tippy toes, even! —Tom), she soon realized there was something still sticking to the glass. So she wiped the surface again, only harder this time. And yet, she could still feel something gritty! Something that felt “fuzzy” like rough cardboard. 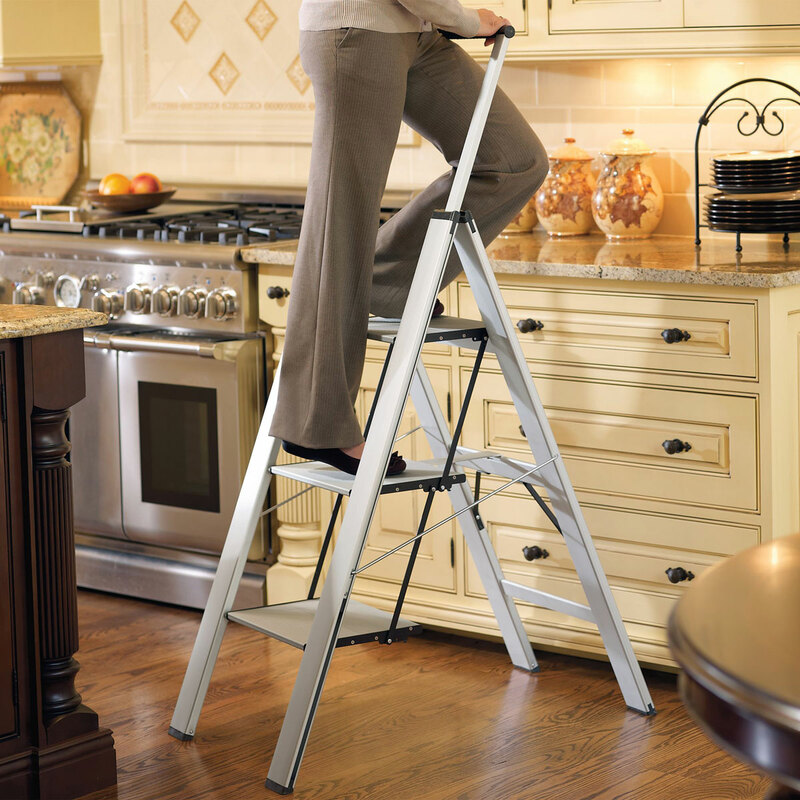 Wilma was understandably perplexed, so she fetched a stool in order to climb up and get a better look inside the mysterious workings of Luke and Nuke. This is not our kitchen, btw. to see the higher working of things! Then we attempt to fix things in our own strength — we get on our tippy-toes! However, when dealing with a truly “sticky” situation, this approach never quite works. We need a step up in order to gain a better, more spiritual look at life. Ask God for His love and acceptance. Ask Him for His help and guidance. Ask Him for a helping hand and a spiritual boost up! Whatever you’re facing, you are Not alone! Your problems did not catch God off guard or take Him by surprise. Trust Him, He’s got this! So ask yourself, “Why are you down in the dumps, dear soul? Why are you crying the blues? Fix my eyes on God — soon I’ll be praising again. He puts a smile on my face. He’s my God.” (Psalm 42:11 MSG) In other words, stop focusing on the problem and focus instead on the problem-solver: the storm-stopper, the miracle-working God of the Impossible! Sometimes our circumstances seem harsh, but the Bible states, “We know that all things work together for the good of those who love God….” (Romans 8:28 GOD’S WORD) Understanding this simple truth is another “step up” to gaining a heavenly perspective. It’s also extremely helpful to remember that people are not problems! But like all of us, people only have problems! View that aggravating neighbor or irritable coworker from God’s divine perspective: through the eyes of His love. Love covers a multitude of sins! (1 Peter 4:8) Then count your blessings — NOT your troubles — with a genuine spirit of gratitude. 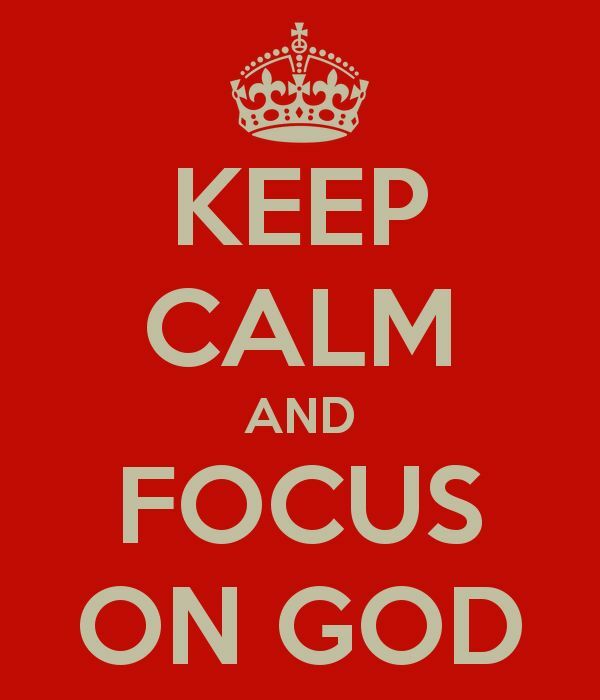 Concentrate on the Most-High God, and not on all the things that get you down in the dumps! Get a higher, spiritually-minded perspective of life … from a perch well above the kitchen counters — er, above the trials and tribulations that clutter our wonderful, sometimes crazy, world!